BASSETERRE, ST. Kitts – St. Kitts and Nevis’ Prime Minister the Honourable Dr. Timothy Harris greeted Her Majesty the Queen April 19 in the Blue Drawing Room at Buckingham Palace. 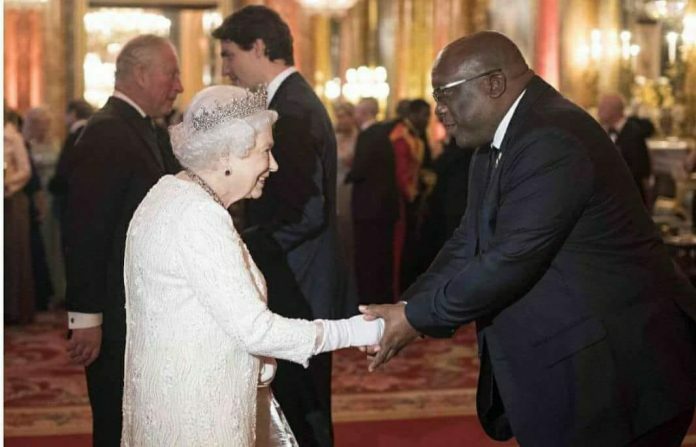 Prime Minister Harris bowed in respect to the monarch as they paid gracious courtesies to each other at a dinner for the leaders of the Commonwealth. Today, the leaders acceded to the Queen’s wish for His Royal Highness Prince Charles, the Prince of Wales, to one day succeed her as the head of the Commonwealth. Queen Elizabeth II has led the Commonwealth, which is a voluntary association of 53 independent and equal sovereign states, since 1952, following the death of her father, King George VI. This announcement comes ahead of Her Majesty the Queen’s 92nd birthday tomorrow. The Queen celebrates two birthdays each year: her actual birthday on April 21 and her official birthday on (usually) the second Saturday in June (http://time.com/5248082/queen-elizabeth-two-birthdays/). Her Majesty the Queen’s birthday party concert will take place tomorrow at the Royal Albert Hall. It will be broadcast live from 8 p.m. (London time) on BBC One and BBC Radio 2. The Queen’s Birthday Party is a BBC Studios’ Production for BBC One and BBC Radio 2.